Iconic Cardiff SmartScreen now LIVE! Maxx Media’s state of the art digital SmartScreen is now live in capital city Cardiff. The 47sqm (10.5m x 4.5m) HD LED curved SmartScreen is the latest to be launched by the UK OOH advertising company, who are delighted to be taking advantage of such a prime audience location in the hub of Cardiff city, delivering an OTS of circa one million per week. 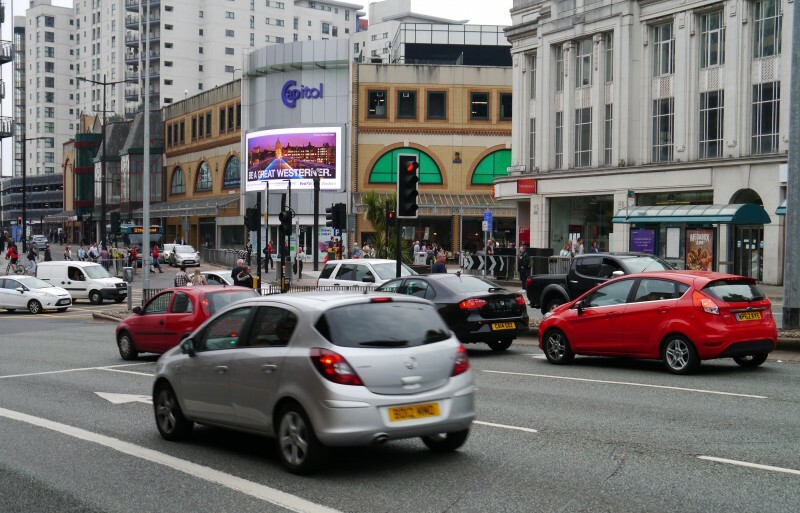 Offering an unparalleled setting on the busiest junction in Cardiff’s bustling city centre, the SmartScreen is a spectacular, standalone, digital out of home product. Located on the corner of Newport Road, Dumfries Place and Queen Street in ‘the country’s sixth busiest pedestrian shopping thoroughfare’, the SmartScreen is now attracting key audiences and delivering unprecedented impacts. The SmartScreen went live showcasing a number of local and national businesses, including First Great Western, Rightmove, Cardiff Airport, the RNLI and Alzheimer’s. With additional advertisers including Wales Millennium Centre and the University of South Wales.